Those of you who know me personally know of my serious love for sandwiches. I will always like the idea of having sandwiches for any meal of the day. Yes sir, whether it's for breakfast, lunch or dinner, I can totally support a meal suggestion that involves delicious slices fresh bread and some kind of savory filling (whatever it is!). I've seen finger sandwiches like these served at all kinds of occasions, especially baby showers, bridal showers and early afternoon wedding receptions. I fell in love with the concept though, and I'll serve them at most any kind of get-together that I can like birthday parties, family barbecues or a relaxed evening with friends hanging out on the patio. At my daughter's second birthday party I served finger sandwiches with pimiento cheese and tuna fillings and cut the sandwiches with tiara-shaped cookie cutters. Yes, I'm crazy like that. I know some will think the notion of finger sandwiches served this way is a bit old-school and simple, but those two descriptive terms don't always equal boring, ya know. In fact, old-school and simple are exactly the two characteristics that make these small bites so charming, if you ask me. There are lots of classic, delicious choices for filling finger sandwiches such as egg salad, ham salad, tuna salad and of course, there are loads of cold cut/cheese combinations. 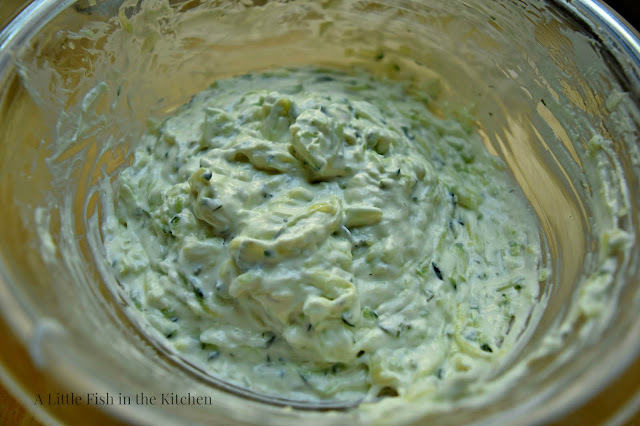 But, during the hot summer months I'll typically choose to serve sandwiches stuffed with this simple, chilled cucumber spread. These cucumber finger sandwiches are vegetarian and the mild flavor of this filling is really refreshing on warm summer afternoons. I mentioned to a friend of mine that I planned to post about cucumber finger sandwiches this weekend and her response was "like the kind served at fancy tea parties?!". I giggled and reassured her that she could safely put her pinky finger down and enjoy these cute, little sandwiches with a chilled cocktail, glass of wine or beer... or of course, tea! 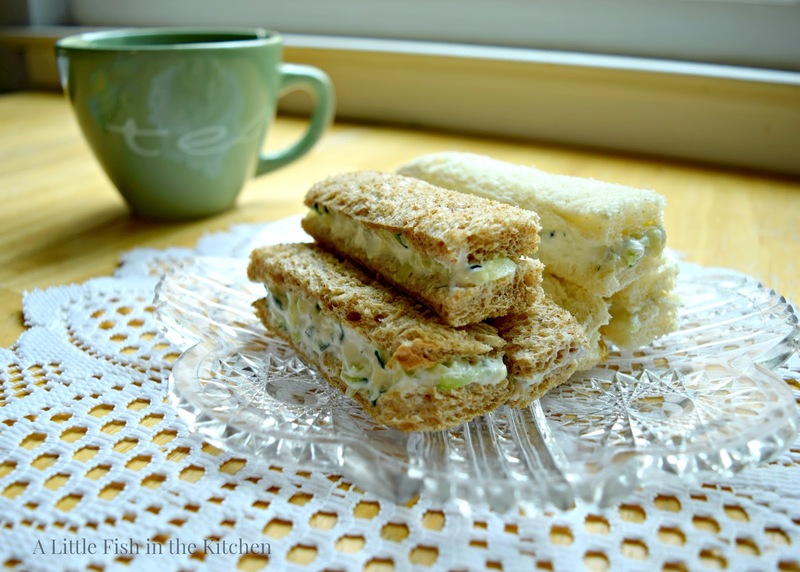 These petite, creamy finger sandwiches pair nicely with a chilled glass of white wine, cocktails or some tea. If you don't want the trouble of making sandwiches with this filling, it would also work nicely as a spread with an assortment buttery crackers. Drain the grated cucumber well on paper towel to reduce the water content. Mix the grated onion or green onions in with the drained cucumber and set it aside. Combine the softened cream cheese, mayo, and spices. Stir well. Add in the shredded vegetables. Cover the cucumber mixture and allow it to chill for at least one hour (or longer when you are able) before serving. 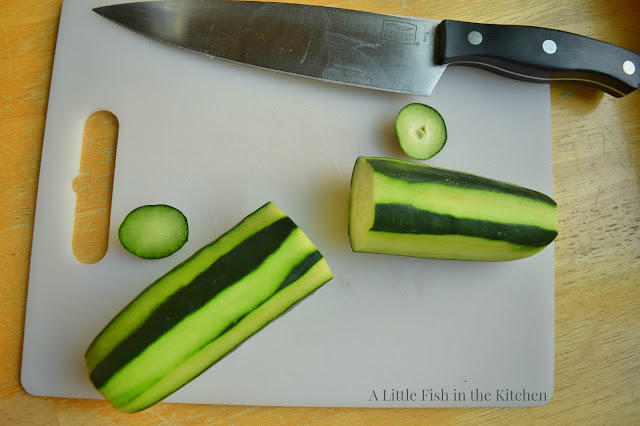 Place 2-3 tablespoons of cucumber mixture in the center of assorted bread slices and spread it out evenly. Use a sharp chef's knife to trim the crusts from the bread slices and slice the filled sandwich into three even pieces. Enjoy! Thank you to the host of this week's Sunday Supper Movement recipe event, Christie Campbell. Please be sure to visit her over at her blog, A Kitchen Hoor's Adventures ! A simple yet very delicious sandwich! The cucumber filling would be great to spread on those pumpernickel bread too. Hi Marcelle, these sandwiches are adorable and I love the filling too. Tiara you say, would have loved to see a pic of those, how sweet. Little sandwiches like these always make me think of tea and feel so fancy! I love sandwiches, too! Your cucumber filling sound perfect for warm weather noshing. I'd be back for seconds! Fantastic sandwich Marcelle. Love how you cut the crusts off. Thanks for sharing your post at Dishing it & Digging it. Hi Linda, thank you for hosting and I'm happy to share at your party! Thank you! I have always wanted to make these with a modern-day tea party! Adorable and delicious! Hi there Barrie, I hope you enjoy them if you make some! Thank you! I love cucumber sandwiches. They are one of my favorite things to make when my cucumber plants are producing later in summer. Yours look delicious, Marcelle! These look fantastic! I haven't had cucumber sandwiches in ages. So refreshing when it is hot and muggy weather. Looking forward to trying your recipe! Great sandwich for a summer get together. I have a friend who runs a business putting on formal teas for people in their houses, and this is one of her most-requested food items. Well, after sweet things. :-) Anyway, awesome job with these -- thanks. 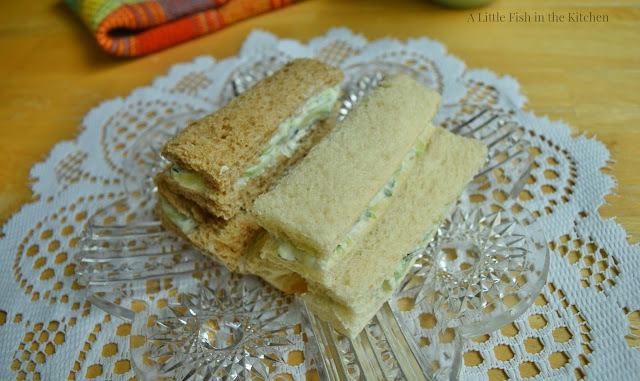 Cucumber sandwiches, big or small, have been a favorite of mine since childhood! Hope all is well with you! Thank you, David! We've been busy packing to move. Can't wait to get there and be all settled in!! I really like your version of the cucumber sandwiches and I'm they would disappear quickly if served as a little nibble with cocktails. I've never tried anything similar to this, but these sandwiches seem so palatable!